Not impressed, dull recordings compared to other interfaces. I travel sometimes and help out friends with studio projects. In my travels I sometimes use great gear and sometimes not so great gear. This one is the later in my opinion. I spent two weeks at a friends home studio doing a project with him and he used this interface. He said he bought it at the time because he likes to record at 96khz and this was one of the more affordable units back in '06. We ran this on a PC running protools with an ART Pre Amp and some AKAI condensors and Shure sm57/58s. This was run using the FireWire 400 slot. We recorded single takes using no more than 6 mics at a time (drums). The unit itself was very stable. We never had any serious crashes or glitches. Occasionally his PC would get overloaded in mixing but that was because of the heavy use of Plugins and his computer was a little behind. The latency was OK but was only noticed during mixing as we properly setup his gear to handle the latency during recording. We used Pro Tools for the entire session and everything seemed to run smooth with the occasional CPU spike from CPU hungry mixing plugins. We never did more than 6 tracks during our session but he did say he would run more when sequencing/recording his synthesizers and that it handled the load just fine. There were no compatibility issues that I experienced. Everything booted up properly and his drivers were up to date so it was all good. I never read the manual. He seemed very confident with the unit and said that he was able to start recording in a matter of minutes after it had been installed. The unit is fairly easy to use. The dsp Mixer that comes with unit makes controlling your ins and outs very easy. 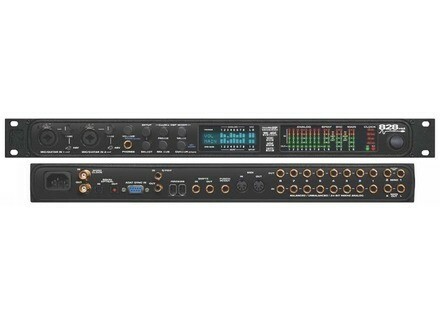 I have been using Totalmix with my RME Fireface 800 for awhile and I found them to be similar. With the dsp mixer and the front face of the unit itself, most of all the typical functions are found very easily. A few things are down in some menus and such, but nothing is too hard to find. What I liked most about this unit is that it was stable and was able to record and mix our entire project in 96khz which was a stipulation for my friend. What I didn't like was how, in my opinion, the recorded tracks were pretty dull, especially the drums. We spent a lot of time with EQ, Compression and various other effects trying to bring life back into them. I think we did a decent job, but as soon as I was home, I compared our Raw tracks with some raw tracks I recorded with my FireFace and the difference was very noticeable. The Fireface had much better dynamics and clarity and in my opinion, put the MK2 to shame. I have worked with some MK3's briefly and find they don't suffer nearly as bad ad the MK2 does with this dullness. I don't know what he paid for the MK2, and maybe it was considered good quality back in the day, but I don't recommend it to anyone who wants a competitive quality of sound. The reality is you get what you pay for. If you want top notch AD/DA, then you need to spend some serious cash.